With the New Year fast approaching, we’re all on the look out for easy and healthy ways to upgrade classic health-bombs. 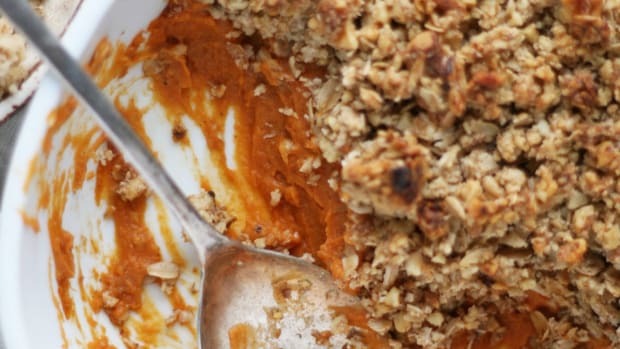 In this case, swap typical mashed potatoes with mashed sweet potatoes for a healthy and delicious version of the classic. The White Potato: Healthy or Not? So, what’s the problem with white potatoes? According to a 2014 report from the Harvard School of Public Health, a cup of white potatoes has about the same effect on blood sugar as a can of soda or a handful of candy. In fact, potatoes are not even included in the vegetable category on Harvard’s Healthy Eating Plate. This is because the carbohydrates in white potatoes are digested rapidly, causing blood sugar and insulin to surge and then crash. This roller-coaster-like effect on blood sugar and insulin release can result in people feeling hungry soon after having a meal. Cue: overeating. Of course, this does not mean you should run screaming from white potatoes at every encounter. 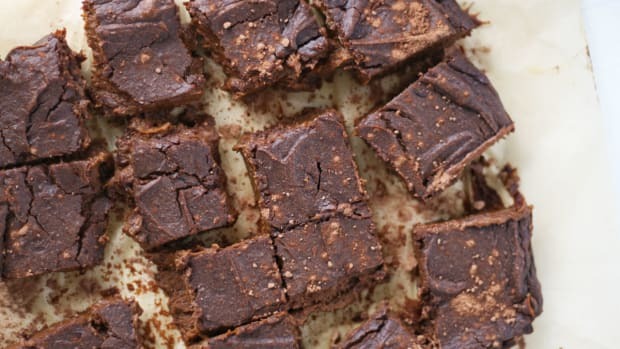 Consider them a treat to be enjoyed mindfully in moderation. Potatoes do contain essential minerals and vitamins, after all, and can be made into delicious homemade French fries - no drive-thru required. 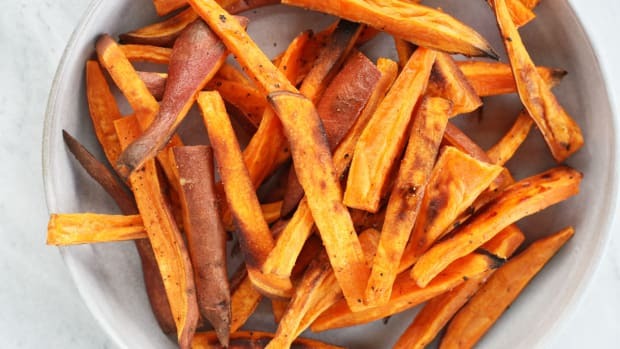 Everyone’s favorite orange tuber has serious health benefits, especially compared to its white counterpart. 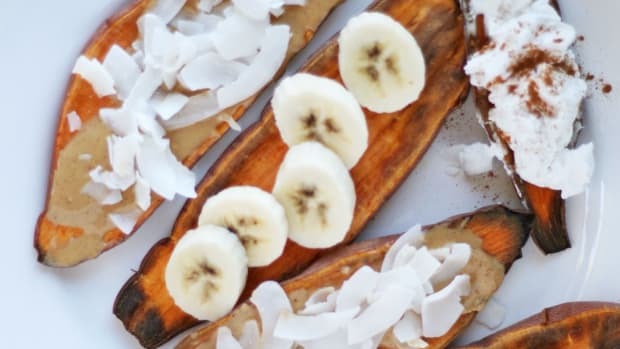 Sweet potatoes are a rich source of fiber, essential vitamins and minerals, and antioxidants such as beta-carotene, chlorogenic acid, and coumarins. Compared to white potatoes, sweet potatoes boast more fiber, have a lower glycemic-index, and contain far more nutrients, including vitamin A. 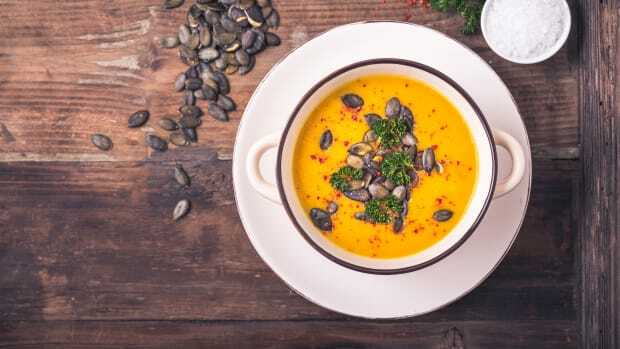 Unlike other sources of beta-carotene (carrots, leafy greens, cantaloupe), orange-fleshed sweet potatoes have been shown to have a superior ability to increase blood levels of vitamin A. 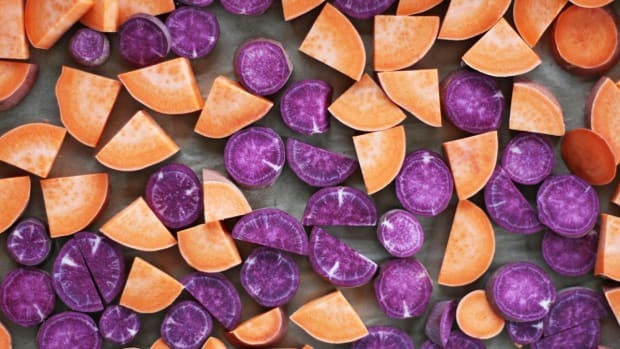 This is because sweet potatoes contain the highly bioavailable variety of beta-carotene. 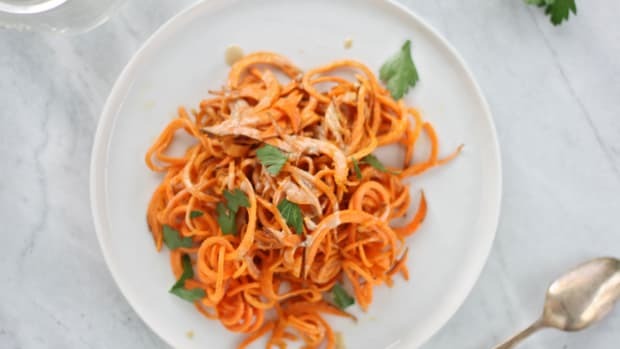 Along with swapping white potatoes with nutrient-rich sweet potatoes, this recipe uses turmeric and garlic for added health benefits. Turmeric is loaded with anti-inflammatory and antioxidant compounds, while the compounds in garlic promote heart health and immune system support. 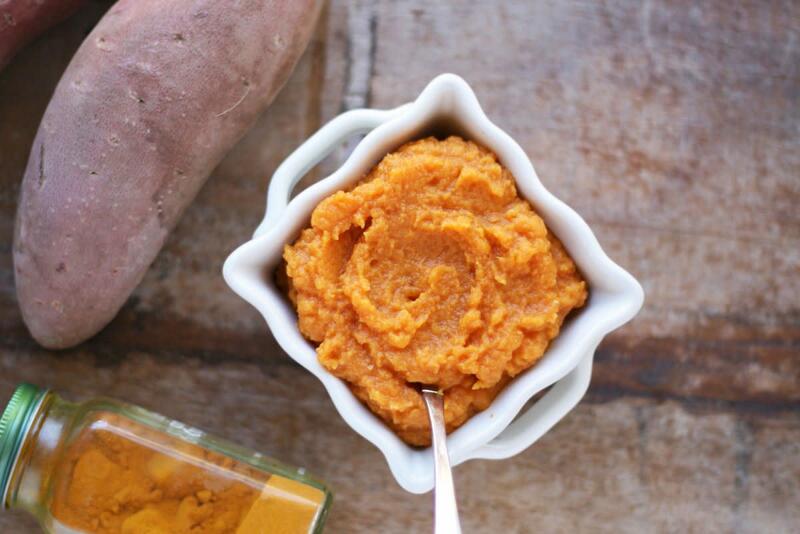 Olive oil adds essential healthy fat to the recipe and make the vitamin A in sweet potatoes more easily absorbed. 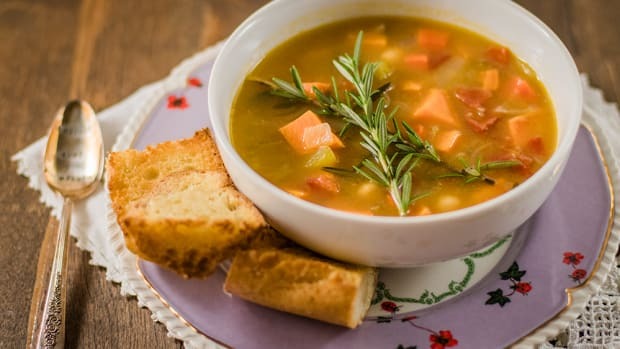 Finally, vegetable broth adds a rich and savory flavor, but could easily be swapped with organic bone broth, unsweetened almond or cashew milk, or chicken stock instead. Fill a large pot with water to just under a steamer basket. 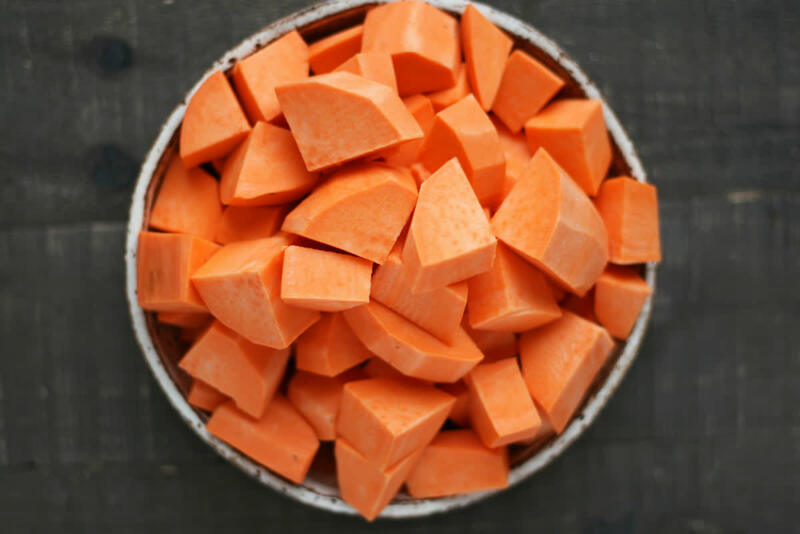 Place peeled and cubed sweet potatoes into a steamer, close lid, and steam for 15-20 minutes, or until sweet potatoes are super soft and can be easily pierced with a fork. 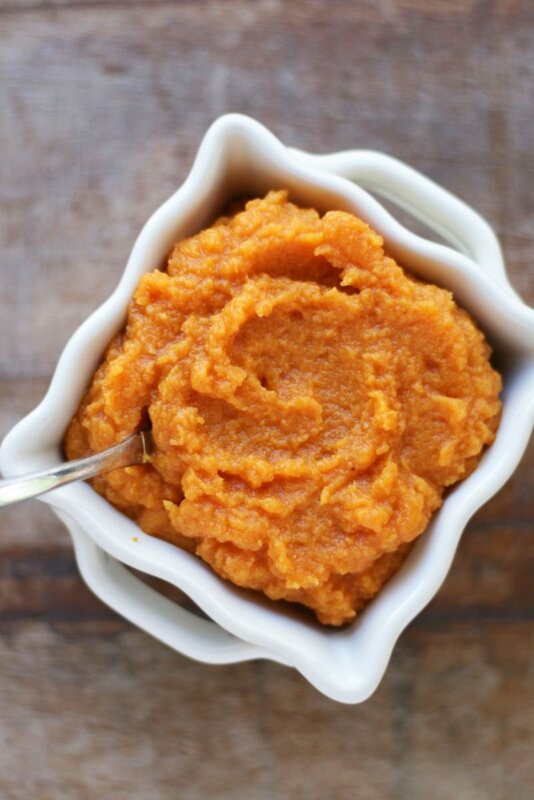 Put the sweet potatoes in a high-speed blender, or add to a large bowl to use a hand beater to mix. Add in the remainder of the ingredients, starting with half a cup vegetable broth, and blend well. If mixture needs more liquid, add the remaining quarter cup of vegetable broth and blend again until texture is smooth and creamy. 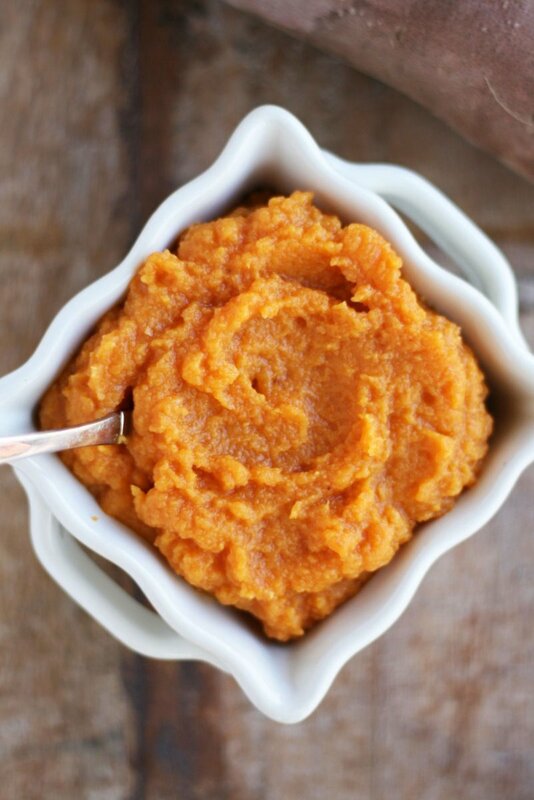 Spoon mashed sweet potatoes into a bowl and serve immediately. Enjoy!